Despite the inclusion of two expansions, it wasn't a particularly long game as there were only five additional tiles which were the ones provided by my expansion of choice: King & Robber Baron! It was tricky at first trying to decide what was worth doing and whether the classic tricks of the base game were as valuable here considering the combination of expansions. So I resorted to my default setting and played as though I was playing any other game, but soon regretted this when Steve started completing my features for me and started getting his meeples into the City of Carcassonne. This was something I struggled to emulate as Steve continued to keep his meeples to himself and rarely provided me any opportunity to close anything of his for him. I killed off a huge, sprawling city of Steve's quite early in the game but I don't think this hurt him too much as it was still pretty valuable at the end of the game despite being incomplete, and he added to it periodically throughout the game whenever he had a large city tile that he couldn't find a use for elsewhere. He returned the favour though, by trapping two of my meeples in a small city that was only worth 7 points at the end of the game. I wouldn't normally have taken such a risk, but with one of his meeples sitting poised in the City section of the City of Carcassonne waiting to be deployed, I didn't want to work hard on my city only for him to share the points with me upon completion. He saw this coming from a mile away and so took advantage of my mistake, then helped himself to an equal share of my points from another city instead. However, because I'd closed the city this time I did at least win the King tile for my trouble which ended up being worth a decent handful of points at the end of the game. Elsewhere in the game, Steve was the first to claim the main farm and even missed a good opportunity to take the Robber Baron tile and get another meeple into the C of C by closing off a road of mine, when he used his turn to get a second farmer onto his unchallenged farm instead. This was surprising, as with both the King and Robber Baron tiles I knew I was in for a decent end-game boost even without a share in the main farm. I tried to play somewhat more conservatively towards the end of the game and after getting a meeple of my own into the C of C I was careful not to provide Steve with too many opportunities to do the same. Several small cities were completed within the final 20 or so tiles, most of which were on Steve's farm, but I'd picked up a couple of small farms of my own and felt that things might have swung in my favour by this point despite Steve's overall control of the game and far better organised strategy (or so it seemed anyway). Within the last few tiles of the game, Steve added a third farmer of his own onto the main farm and then added 1 of my farmers, knowing that I couldn't then use my farmer in the C of C to tie the farm. So instead, I placed him on another farm serving just 2 cities instead. 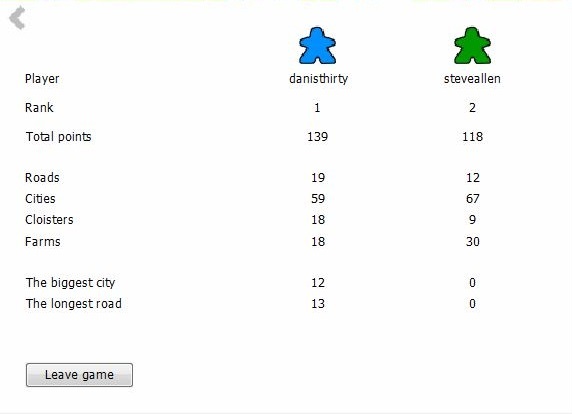 The final scores were something of a surprise but the 25 bonus points I won for having completed both the largest city and the longest road made all the difference despite Steve's complete dominance in terms of farmers. So, in terms of points, I won 3 pts for winning the game. Hooray! Final score: 3 + 2 = 5 - 2 to me. Thanks for the game The Steve. Really looking forward to seeing how the rest of our practice league plays out. But it already seems like we're in for a treat and I can't wait to share it with the wider community once any bugs have been ironed out! There were many good things arising from my game against Dan last night which I hope will be a big attraction to this tournament and the way it is structured. Firstly, and very importantly, is the fact that I did not feel in any way that I had 'Lost' the game and was quite content to see that I managed to get 2 league points from the fixture. I appreciate that my opponent got more points than myself, but this was largely down to the simple fact that he coped better with 'The Count of Carcassonne' (my adopted expansion) than I did with the King and Robber Baron (his adopted expansion), and was therefore fully deserved. 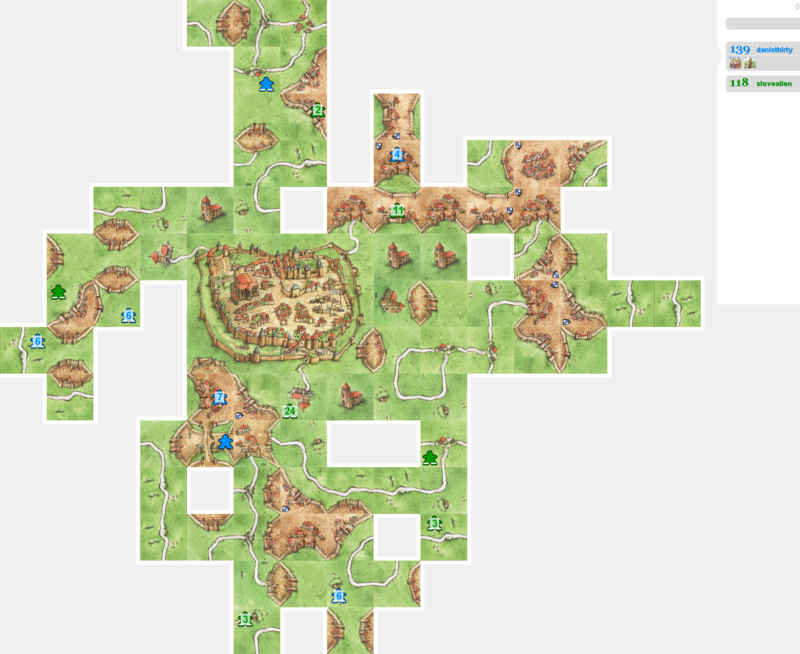 Secondly, if I had managed to accumulate 8 more road points and 10 more cloister points, bring the scores to 139 - 136 to Dan, then I would have accumulated 4 league points for winning roads, cities, cloisters and farms against only 3 points to Dan for winning the game. This is a very important factor in the tournament and needs to be a strategical consideration in your games. This will possibly come to the fore if anyone uses the goldmines expansion, where it is highly possible to win a game with the lowest points score for 'the main four' features. As we now appear to be up and running, I would ask my testing team to try and organise matches as soon as possible to give me time to iron out any problems that we find before the 'real' tournament gets under way. Please post results and screenshots on this thread. Rosco? Halfling? Chooselife? Rich_The_Fish? When works for you guys? Bare in mind: you need 2 cloisters to score 10 more cloister points, if you got them, Dan wouldn't have score 18 points for completing 2 cloisters. His score would have dropped to 118; you'd have won the game and got the 2 league points and scored the cloister points. 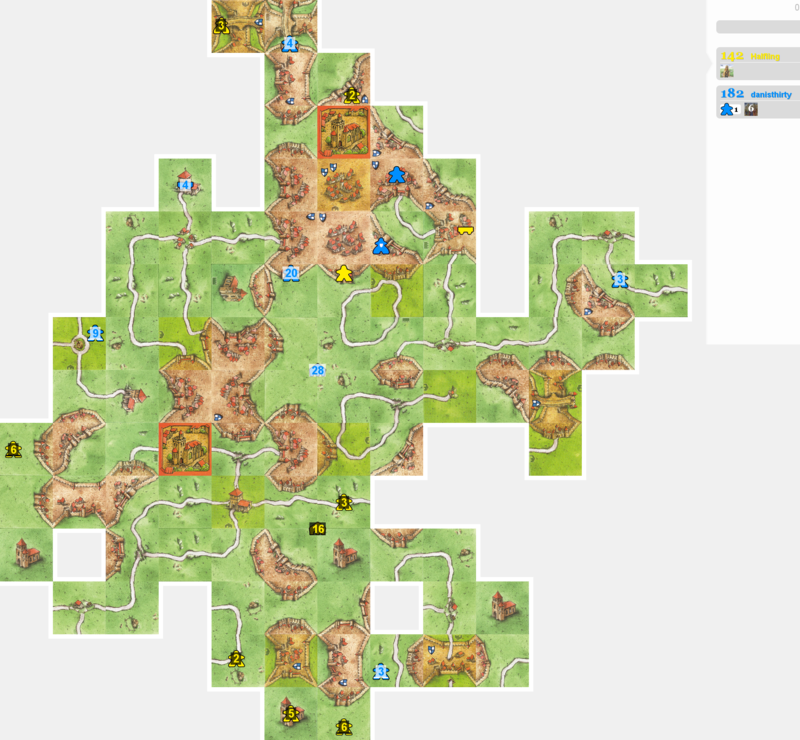 You are forgetting the power of the Count of Carcassonne. I didn't actually get any cloisters. I simply glommed on to one of Dan's via the city of Carcassonne. This means that I could have done the same again and also jumped onto empty cloisters as they were finished. I never got such a chance unfortunately. I didn't actually get any cloisters. I simply glommed on to one of Dan's via the city of Carcassonne. I always forget how much there is to Abbey & Mayor until about 2 seconds before the game begins when I'm suddenly reminded of Mayors and Wagons and Abbeys! None of these elements really complimented the King & Robber Baron very much, but there was an interesting mix of tiles which made for an interesting game. As you can see, the final scores were 182 - 142 in my favour so that's 3 league points. In terms of individual elements I won on cities, cloisters and farms for an addition 3 points. 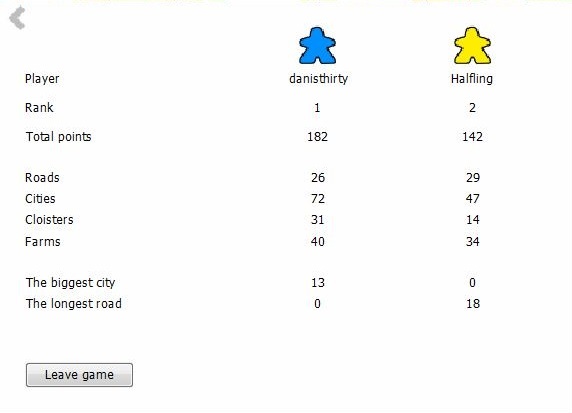 Halfling scored more on roads than I did though, and so takes 1 point for that. Overall then, the league point scores were 6 - 1 to me. Thanks for the game Halfling! Thanks for the game Dan. Losing the game is bad enough, losing the other factors rubs salt. Since the scoring of individual mechanics already contributes to the win/loss, won't these bonus points simply extend winning margins? That is a good point halfling- maybe have those individual score but with a max score for any player per game of 4 points. So a win with all the features won will be 4 but a lose with all features won would also be 4. It won't stop me participating, just an observation. Thanks for the comments Ross and Richard. I am taking note of your ideas and thinking about what you are saying. It might be an idea to try playing for league points, rather than to win the game. I don't know how much difference this will make, so I will be trying it out. I'm sure that there will be hot discussion in the Slack chat about this before the final version is agreed. Please join us as and when you get time. I can't access Slack via work laptop, so I'll be occasional evening only. Having discussed with my learned friends at some length, we have all agreed that the points system would be better to give one point only for the win, instead of the three that I originally suggested. You can see what difference this makes on the attached tables. We are now considering 'Tie breakers', and hope that you will all get involved with this as the 'Test league' develops more.